A makeup addict, on well in this case, a makeup geek can never have enough eyeshadows and pigments. 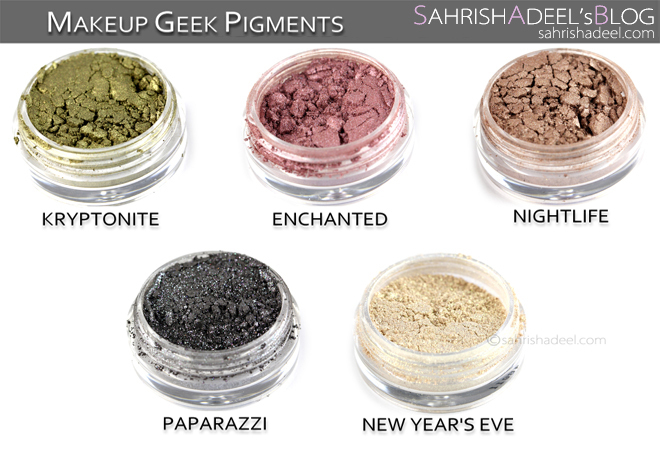 Today I am going to review five more pigments by Makeup Geek hoping that this post might help you make your mind on what to choose for your New Year's Eve. These pigments come in plastic transparent jars with black plastic screw lid. They do not have sifters but now you can buy sifters from Makeup Geeks website so don't forget to add a pack in your cart while buying these pigments, your life would be mess free. Jars are labelled at the back with names and quantity details. Label says that each jar contains 1.4 grams of product while it actually has 2 grams of product. Kryptonite is described as Moss Green shade but I would go for army green shade with metallic to shimmer finish. Loving this shade of green as this color is my favorite since childhood. Enchanted is now one of my favorite shade in purples. 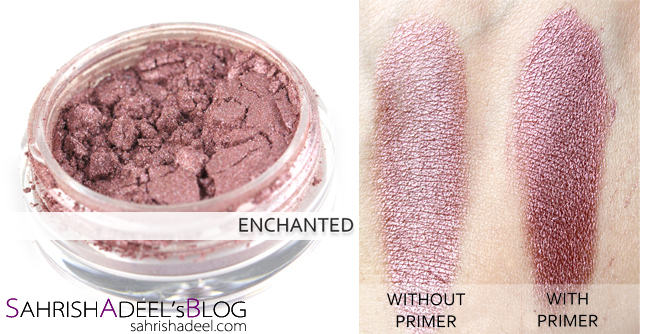 This is a beautiful plum shade with a very smooth shimmer finish. 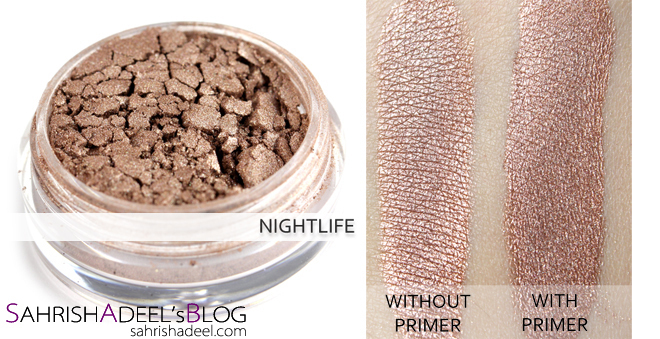 Nightlife is a light brown shimmer shade and I am sure everyone of us tend to collect more earthy tones than brights at a certain point and this would be a great addition in the collection. Paparazzi has so many personalities. It is a dark grey to blackish shade with glitter that reflect light in various different colors and to be honest, no matte what I did, my lens could not capture the beauty my eye could see. A must have shade if you ask me. 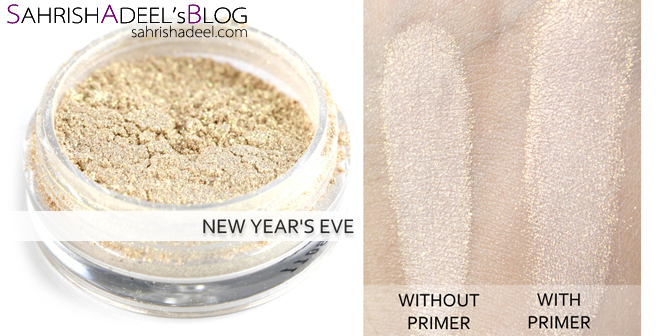 New Year's Eve is the lightest gold there could possibly be. 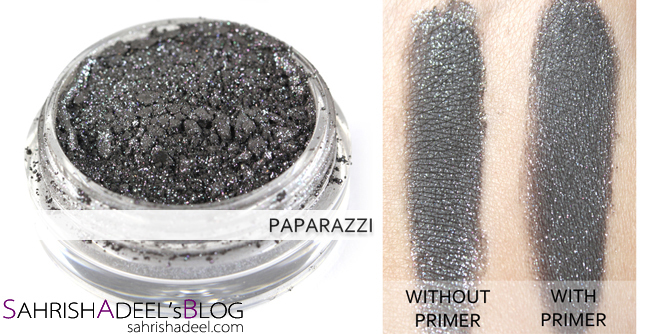 It is a gorgeous shimmer shade that can look evenly good if used as an highlighter for face & body. Oh and as the name suggests, you gotta own this for the New Year's Eve. Since my last review on Makeup Geek Pigments [click to read that], Marlena and team have come up with more shades and they did it again. Love at first use! As you can see in swatches, some shades look fine without primer but like previous pigments I tried by MUG, they start to crease on my oily lids really quickly and intensity weights down too. The primer I used for these swatches is Professional Eye Primer by MUA. 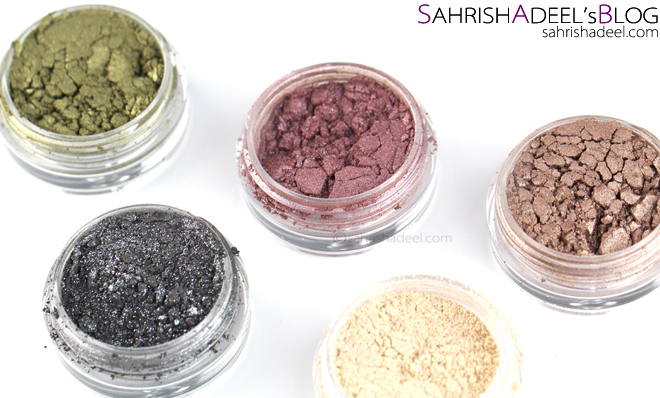 All of these are highly pigmented and go onto the lids pretty smoothly Since they are loose pigments, one cannot complain about fall outs until or unless used in really tiny amount and applied super carefully. With an eye primer, they go onto the lids just fine but I can visibly see how beautiful they stick to the lids resulting in less fall outs during application. They did not crease or toned down for over six hours and I believe that they will stay onto my eyes for over eight good hours. Plus, I did not notice any fall out later in the day. Overall, I am loving these pigments. My personal favorite out of these five is New Year's Eve, you can use this in many different ways. Formula, texture and staying time is great for all of these. 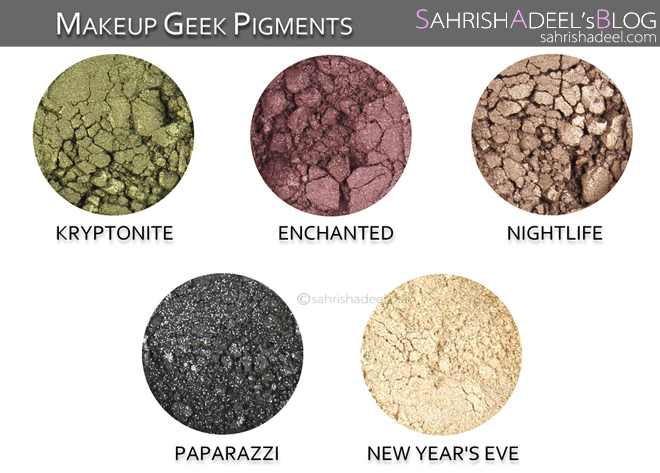 Each Makeup Geek Pigment costs $6.99 and can be bought online from Makeup Geek's website. They ship worldwide at affordable rates.